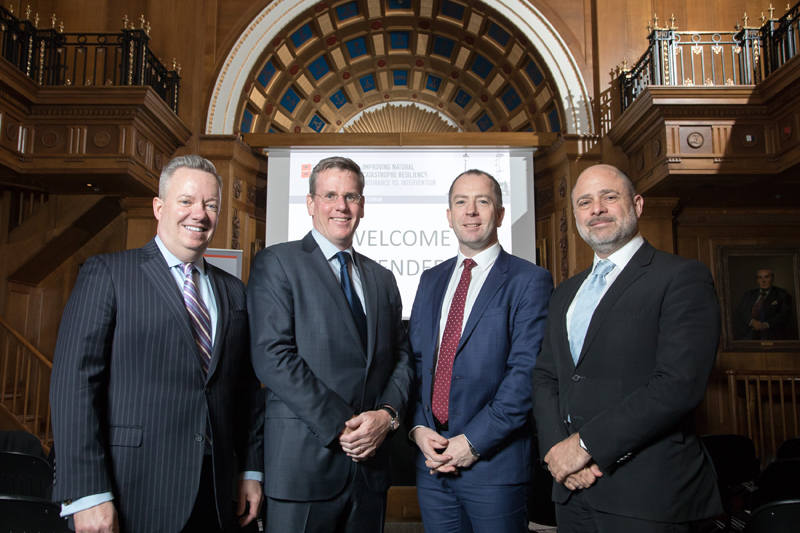 In light of the rise in natural catastrophe events occurring during the 2017 Atlantic hurricane season, approximately 100 leading insurance industry experts, policy makers, scientists and environmentalists gathered at Lloyd’s of London yesterday to discuss strategies for improving natural catastrophe resiliency and closing the protection coverage gap at the “Improving Natural Catastrophe Resiliency: Insurance vs Intervention” forum sponsored by Bermuda-based RenaissanceRe Holdings. The forum covered a number of important issues raised by the recent rise in hurricanes, earthquakes, wild fires and other events, including the importance of promoting resiliency before the inevitable next storm; the role of risk-based insurance rates in consumer decision-making; the positive incentives working to drive mitigation efforts in urban environments; and the role of the private sector in boosting rebuilding and local economies following a disaster. Kevin O’Donnell, President and CEO of RenaissanceRe said, “2017 will be the third year having more than $100B of insured losses over the previous fifteen. This recent loss activity demonstrates the value of private insurance but also highlights the protection gap. John Huff, Immediate Past President of the National Association of Insurance Commissioners [NAIC] and Former Director of the Missouri Department of Insurance spoke about the unintended consequences that occur when intervention makes matters worse, offering insights into how lessons learned from past mistakes are helping to inform current actions. Aidan Kerr, Director of Operations for Flood Re, speaking at the Forum, shared examples of best practice for partnerships between the public and private sectors to make flood insurance more available and affordable. “Flood Re is committed to providing information to improve people’s understanding of their flood risk and how they can take action to manage and reduce their risk,” said Mr. Kerr. “Thanks to the establishment of Flood Re there is now a greater choice of affordable home insurance policies for householders at risk of flooding. Stephen Weinstein, Group General Counsel of RenaissanceRe and Chairman of the RenaissanceRe Risk Sciences Foundation, the lead sponsor for the Forum, added, “The large natural disasters we’ve seen in 2017 underscored once again the value of investing in both financial and physical resilience. Research consistently shows that every $1 spent in risk mitigation saves $4 in recovery, and better preparation clearly saved both money and lives in 2017.